Building neighborhood connections are the cornerstone of our business, and our Villa Park pet center took that to heart when they inspired their neighbors to join forces with the police force! Each year Villa Park picks a shelter or cause to help at the holidays, and this year they chose to work with the K9 units of several area police departments. 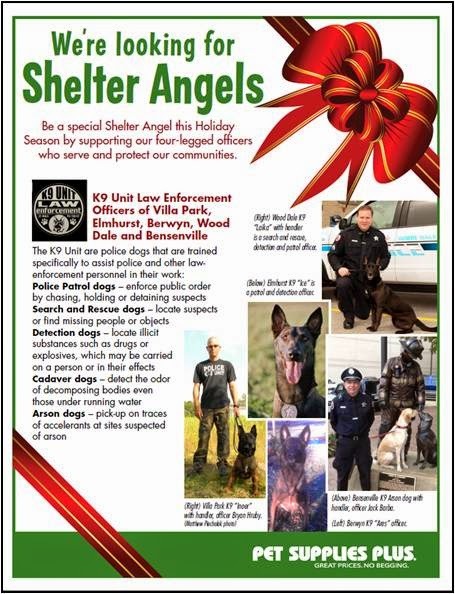 The team at Villa Park created flyers to hand out to all their neighbors, and those flyers (pictured) raised awareness about what the fabulous Berwyn K9 unit accomplished - everything from search and rescue to helping determine the accelerant used in a suspected arson. Community bonds were strengthened as neighbors shopping in the store donated food and other needed items for the group, and about $500 in cash was collected for the cause. The Berwyn Police Department, one of the benefactors of this drive, was thrilled to have been on the receiving end of the team's hard work. In a letter to store owner George Lennon, Division Commander Giordano Manfredini wrote, "Pet Supplies plus has been a very generous supporter of our K9 unit throughout the year. Please extend a special thank you to your Villa Park store team members for thinking of us during their Shelter Angel Program!" Marketing Director Patti Papageorge said, "Jack Noe, Joey Keehn and the rest of the team at Villa Park have been doing an outstanding job building these strong relationships that are a vital part of their communities." 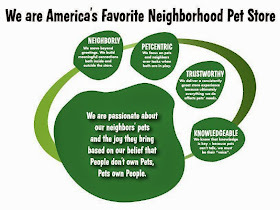 Indeed, it's just the kind of neighborly behavior that sets Pet Supplies Plus apart from the crowd!